Use slipcovers for old couches and give tired furniture a whole new look. Covering an old couch in a new slipcover is a great way to disguise worn fabrics, hide stains, and update your living room without having to go to a lot of trouble or expense. Ready made slipcovers are designed to fit easily over chesterfields. There are one-piece covers that cover the entire sofa, or you can purchase slipcovers that fit over the existing frame and have separate covers for each individual cushion. These are great if you ever want to replace one cover (if there's a spill or stain on one cushion you don't have to recover the entire sofa). Slipcovers range from tightly tailored styles that look almost like upholstery, to loose and relaxed styles that have simple ties or buttons holding them in place (common in cottage chic decorating). Custom slipcovers that that are made to fit exactly over a specific piece are the most sophisticated look, while looser versions are more casual. Some readymade slipcovers claim to fit almost any couch, but be wary of these as they often end up looking loose and ill-fitting. If you're buying ready made, try to find ones that are made to fit your style and size of couch. Custom tends to cost more money, but the result is usually a more tailored fit. Slipcovers are useful for many reasons. For ugly and outdated furniture, slipcovers offer a quick fix without having to buy a new piece. If a sofa is stained and can't be cleaned, or if the fabric is in need of an update, a slipcover can provide a quick and easy makeover. 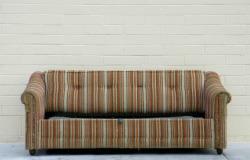 Couches are a big investment and purchasing a new one isn't always feasible. Using a slipcover on an old couch can be a more budget friendly alternative. Slipcovers also come in handy if you want to coordinate mismatched furniture. Cover an old couch in a new slipcover, and it can tie a disjointed room together. Slipcovers also come in handy if you like to change your décor with the seasons. A crisp white cotton or natural linen that looks great in the summer months can be replaced with a cozier fabric during the fall and winter. Look for slipcovers that are made of a fabric that can be tossed into the washing machine. Heavy-duty fabrics like canvas and twill are just a few possibilities for slipcover fabric. Slipcovers can even be made in leather and microsuede. People who are making their own slipcovers should wash all of their fabric before sewing the slipcover to ensure the proper fit after washing once it is made. A lot of furniture and department stores that sell couches also sell slipcovers. As a general rule, the online options are more plentiful than those in-store. Check the websites of stores like JC Penney, Ikea, and Pottery Barn. You can also do a general Internet search and come up with others in your area. If you want something custom made you can consult a furniture upholsterer who can certainly do the job, and probably for a very reasonable price.